Question: I'm working on a project that requires a 10000 gallon water tank, actually five or six of these tanks would be optimal. I need to store processing water for various uses on my job site. Its not necessarily gray water, but it will not be used for drinking purposes. Do you have large tanks like this available? 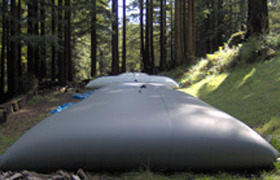 Answer: For the type of water storage you are requiring, an economical option you might consider is the Collapsible 10,000 gallon Water Tank. This tank uses an extremely flexible design, making it one of the most economical ways to store large gallon capacities in a single location. Since you have mentioned that you are intending to store process water, a great option for you might be the gray water pillow tanks. These units are made from either a polyurethane, polymer alloy, or E PVC coated fabric to allow for contact with various liquids. Sizing: The sizing for a water tank can vary anywhere from 1 to 250,000 gallons in size. This can easily include a 10,000 gallon model for storing liquids on sites and other storage locations. Fittings: All fittings used for the collapsible tank are designed to help ease the tank use, including the process of filling and emptying a tank. Standard fittings will include a ball valve, pressure relief vents, and caps.